Your challenge is to build a cool “thing” with only two requirements: it must use a microcontroller (something like: ESP32), and it must connect to the internet (something like this). That’s it. Step one: Form a group — groups can consist of moms, dads, grandpas, co-workers, former bosses. Literally any bipedal mammal will do. Or, if you are truly dope, you could go it alone. Step two: Get a microcontroller. These things are everywhere (on Sparkfun, or on Google). Make sure yours supports WiFi. The last step: Write some code and bask in your infinite glory. There’s probably more to this step than just writing code (like flashing code onto a microcontroller) but, that is where DSM Web Geeks and Area515 come in. From now until June we’ll hold events to help you out. With example code, and access to tools. Sounds easy right? 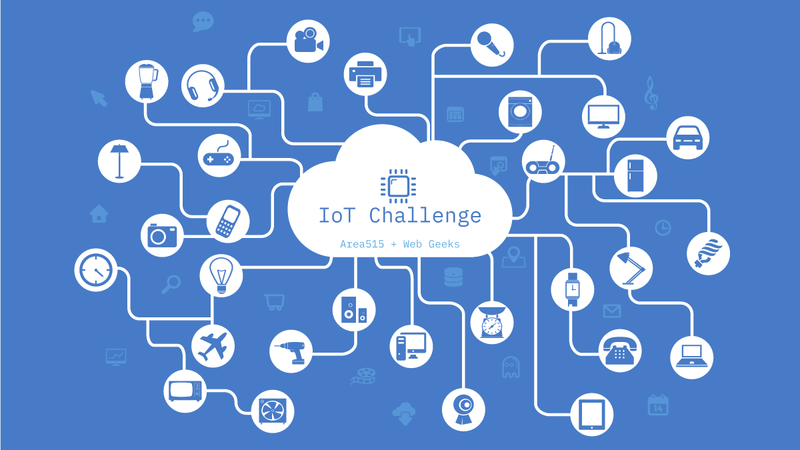 If you need help getting started attend a May event with DSM Web Geeks or Area515 to learn how to use microcontrollers and build an IoT project. The challenge ends in June. We’ll meet up to show off our projects and hand out prizes! You must incorporate a WiFi enabled microcontroller in your project, and send or receive data from a network. One can be purchased from Area515 for $5 or you can supply your own. For details email [email protected]. Be prepared to share your code using GitHub, Pastebin, or other publicly linkable site. You may use code from other people. It must be open source and available online. You can work on the project solo, or have a team. In June we’ll meet to present projects. Please be prepared to demo your project and let us know how it went. Even if nothing works, we would still like to hear what problems you had to work through. There will be time and assistance before presentations to get your device(s) on the venue’s wifi if needed. If your project needs to be at a specific location/environment/time to work, have a video of it in action to share. Your project does not have to necessarily work when presenting. If your project goes south spectacularly, present anyway! Share what you learned and what you were trying to do. We have prizes for all states of completion!